Synopsis: “A man wrongly convicted of conspiracy to commit espionage against the U.S. is offered his freedom if he can rescue the president’s daughter from an outer space prison taken over by violent inmates” (Ram Entertainment). Verdict: A one-man rescue mission action film that tries to stand out from the similar movies in the past but fails miserably with nothing to offer besides corny sarcastic wits. It’s like a really lame ripoff of Die Hard (1988) set in space. 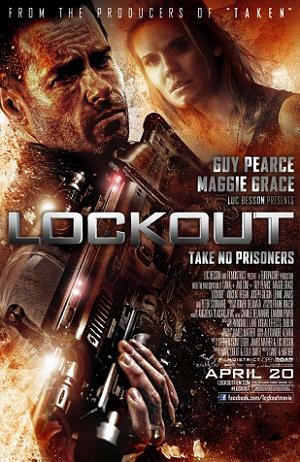 Lockout kicks things off in style with the little interrogation and flashbacks with Max Payne-like visual effects and then it gotten absolutely lazy, seemingly hoping that the sarcasm lines from the protagonist (Guy Pearce) are entertaining enough to hide the uninspiring plot, the bad acting, and the lack of engaging action scenes. Instead of having a last climatic brawl that viewers would expect from an action movie, it ends with an unnecessary twist before the cliche closure kiss scene between the protagonist and the girl (Maggie Grace). Second opinion: “The story’s quite fake but I liked the graphics” (Iris Loong). Pointless punishment? Convicts are sentenced to sleep for many years so if I killed someone, not only I’d get to go to outer space, but I’d get to fast-forward the years as well? How awesome is that? The technology is so advanced that… they prefer to use the fan machine to float people up instead of just letting the zero gravity in outer space to do the job. 500 bad asses… who follows the lead of one “smarter” prisoner (Vincent Reagan) with an Irish accent whom none of them dares to oppose besides his own brother (Joseph Gilgun). then starts killing them one by one himself. The president’s daughter… is hot and she can stitch, maintain calmness better an actual doctor, fight and fire big guns. Sure, right. Special thanks to Nuffnang and Ram Entertainment for the invitations to the premiere screening. Hmmmm I am not watching this movie. I can't believe you killed the movie with your ratings! I actually watched this just now, and I find that Guy Pearce's one liners are actually what makes this movie bearable, I would rate it slightly higher than 1. LOL. This isn't really a review of the movie. It's just like bullet points in a presentation, but without the coherence.